Designed by Blaze Makoid Architecture, this North Haven, NY project is a 6,000 square foot home, spread across two, half-acre waterfront lots. 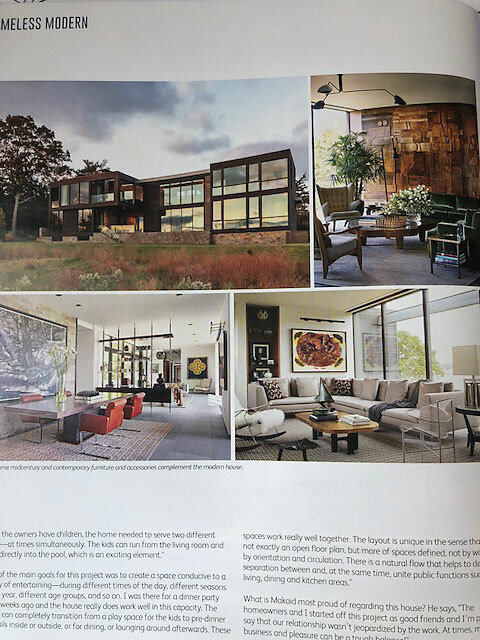 As the homeowners, Jon Vaccari and Stephen Fleming, often host family and friends, the goal was to create a design conducive to year-round entertaining, while taking full advantage of the sweeping views across Sag Harbor Cove, the village wharf and a small, salt water pond. and a sofa and chairs of his design. 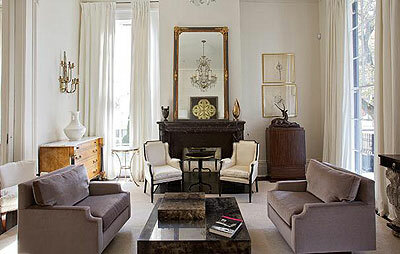 In the parlor Vaccari created a soft and romantic space with a sizzling and contemporary edge. In the dining room French chairs mix with the 1940s Italian sconces and a 1950s French mirror. 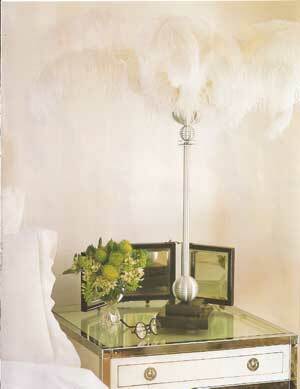 The glass table sits on twentieth century Italian, bronze rams heads. and his apartment spreads throughout the second and third floors. a more relaxed, colorful den. Keeping an old workd charm, but creating a new flow for the way we live now." Landscape Design by Erik Ernst of Riverland Landscape Design, Inc. Things are often askew in the French Quater, so it should come as no suprise to find a swimming pool in Jon Vaccari and Steve Flemming's front yard where Moroccan lanterns and delicate iron benches mix with pale shutters. Two toned hardwood floors in the living and dining rooms "form a direciton in a room that you don't normally have with a solid color floor," says Kost. "This expands and ties the rooms together and adds an archictectural punch." Antique armcharis covered in Nancy Corzine fabric. 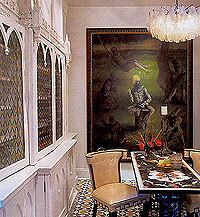 Painting by Hunt Slonem hangs over mantle holding Moroaccan lanterns and glass sculptures. Antique chaise upholstered in Great Plains fabric and 18th-centuary rtoot wood table stand beneath Brian Borrello panting. Iron lemon trees from a villa in St. Tropez, a rug woven from goat hair and a rare blue mercury-glass table lamp were all Paris finds. Tranquel pallette continues in dinning room with corner banquettes designed by Vaccari and upholstered by Rogers and Goffigon fabric; pillows in Quadrille silk and Bergamo stripe. Creation Baumann stripe on seat of wood chair. 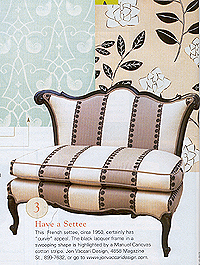 Upholdetered chairs wear Castel gold-rimmed crystal and Royal Crown Derby "Gold Aves" china. Art Deco pieces include bar and sconces. Wall-mounted palm fronds from New Orleans' Fairmont Hotel's historic Sazerac Room. Moroccan rug. All bouquets by Steven Sonnier,Dunn & Sonnier Antiques and Flowers. What lies hiddeen behind old walls of the French Quater is always intriguing. Visitors walk the narrow streets peeking into gates and porte cocheres for glimpses of how people choose to live with the past. 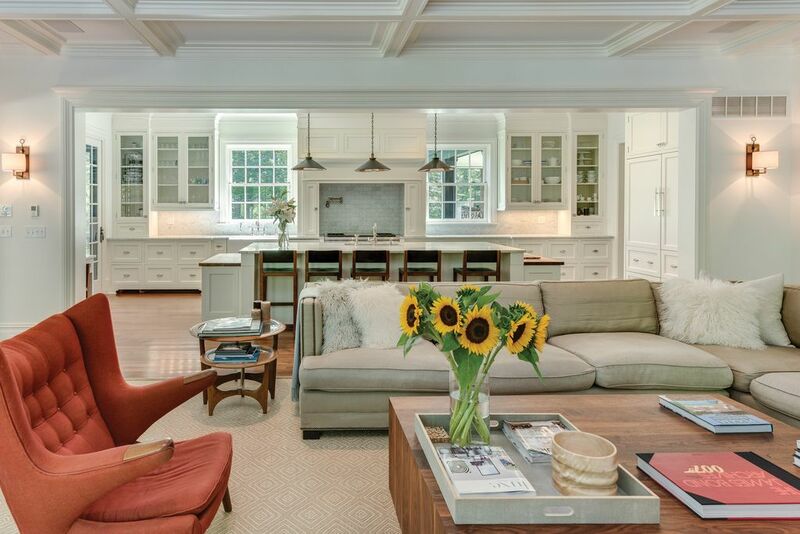 Although aged is a given in this district, Jon Vaccari and Steve Flemming's circa 1830s house has a fresh, new spirit. " I want everything life has to offer in the French Quater,' says Vaccari, "and also privacy, parking, courtyards, and a swimming pool." He and architect Robbie Cangelosi to an L-shaped former slave quater and turned it into everything the owners want for their style of living. "I love entertaining" says vaccari. "I love brining people together. I love living outdoors. Living life is everything." The Victorian house in front of their property burned in the 1870s, leaving a rarity - a French Quater front yard with enough space for parking, courtyard and pool. Privacy came with the design of a brick fountain thickly planted with azaleas and a large ligusturm tree. Across the back of the property a new two-story wing was built in the same style as the main house. Now the house is U-shaped surrounding a rear courtyard accessable from three sides from living quaters. "It's perfect for us, " says Vaccari, "since everything flows from indoors to outdoors." Vaccari's design career began in Los Angeles, where he still collaborates with Susanna Kost. Working in tow quite different markets works quite well for them. "I love the old Hollywood look of the 30's and 40's, he says, "and I love the antiques and decadant flair of New Orleans that you can't find anywhere else. I also like a touch of ethnic to give it an edge. I'm attracted to morracan design. In my new houses I combine it all." He and Kost enjoy working together, she says, "because we fill in each other's gaps. This is what make collaboration fun. We have a great time shopping. We're decicive; either we like it or we don't. We each have strong opinions and simmilar ones, but with enough differences to make the creativity spark." "We're a good team" agrees Vacari. "Susanna is crazy about details - beautiful fabrics, pillows, textures - she pulls everything together perfectly. I like dealing with all that, too, but my forte is the big picture. 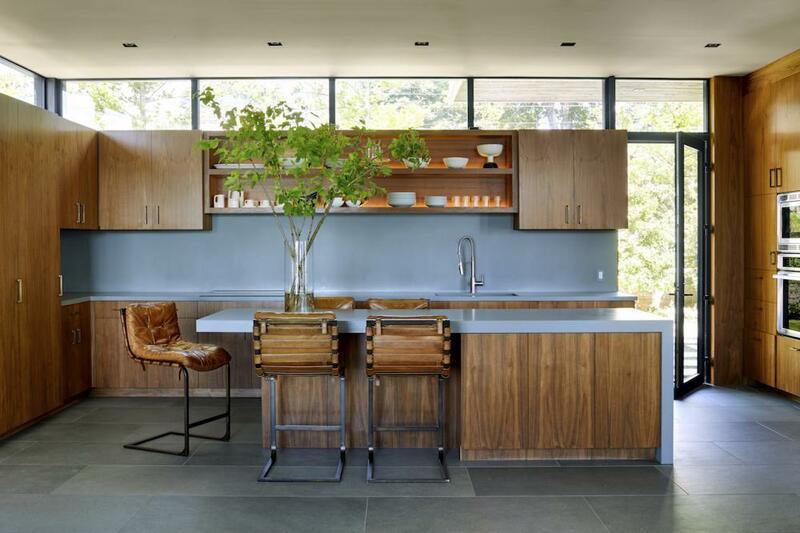 I walked into this house and saw how the right renovation and furnishings would make it flow." Vaccari opened up the house by tearing out old partitions that boxed in tiney rooms. "Now rooms are large and open." Furnishings are flexible. For example, the dinning room i usually set up with coffee tables in front of tiney banquetts. By subsituting larger tables the room is ready for dining. 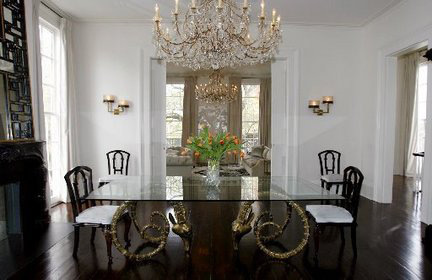 "Traditional dining rooms seem like a waste of space," Vaccari says. "My guests cna relax and lounge or I can throw and elegant dinner party." Last renovated in the 1950's, thje house has now been thouroughly updated. A multiple- use den instantly converts to a theatre with a state-of-the-art sound system and a screen sliding down from the celing. A staircase to the attic created a third-floor hideaway. 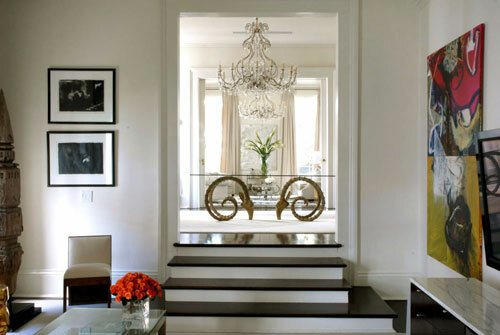 For more elegance, moldings were added and doors heightened and redesigned to correspond with exterior French doors. Kost's sure hand with fabrics plays a role in the drama. "As contrast to the usual New Orleans decor-old, dark patinas, noble decay-we wanted the house to look new, light, and fresh," she notes. 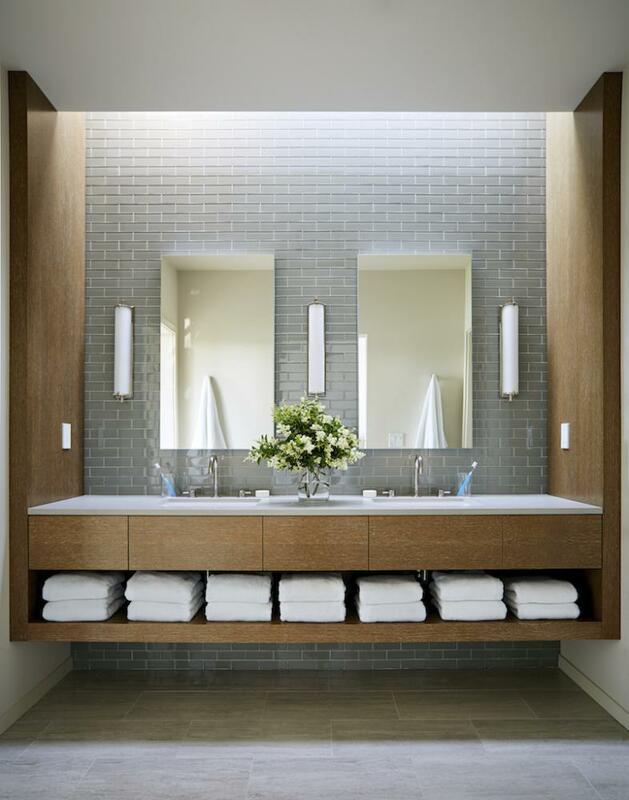 "We chose icy colors for tranquility-, light blues, off-whites, cool greys, pale pinks." Furnishings were carefully edited. "We don't wear all our jewlery at one time do we?" When vaccari sold his former domicile, "Steve and I moved from grand to intimate. Because of the difference in scale and celing height, we had to get rid of nintey percent of our furnishings. It gave me a chance to create something entirely different." That chance to create is crucial. "I'm always in search of a creative outlet," adds Vaccari, who already has another project: a new studio and showroom on Magizine Street to present his furniture designs. Art Nouveau mirror hangs above sofa found at Paris Flea market. When Vaccari bought the round table it was painted white; he refinished it with gold and silver accents. Chair wears original 1950’s fabric. 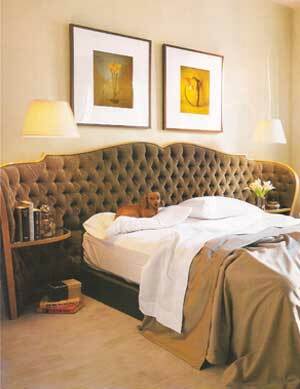 Mona poses before a dramatic 1930’s French headboard with Pollack & Associates tufted mohair. 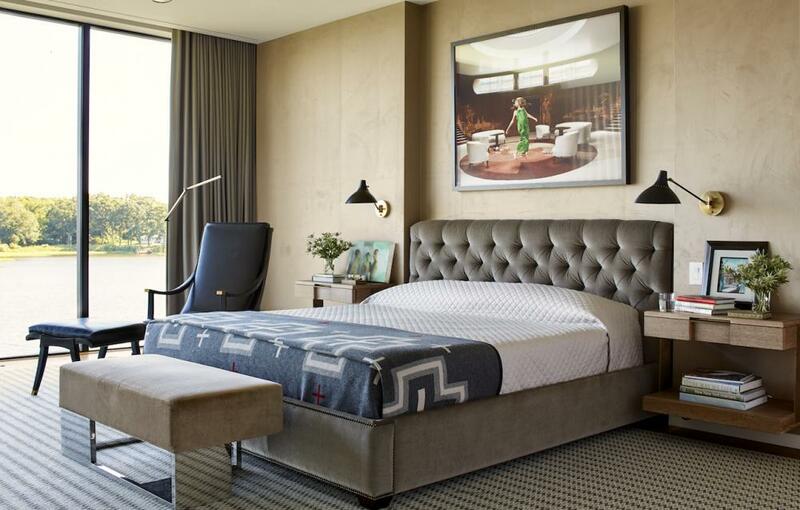 Jon Vaccari Design is reproducing the piece, which includes built-in bed side tables. Holland & Sherry fabrics fasherion bedspread and drapes. Between Philippe Stark lamps are photographs by Mastatomo Kuriya. What sets you apart? My fresh take on classicism – I respect the traditions inherent in the “old New Orleans” style, but I update them for life in the 21st century. It’s all about the mix, really. 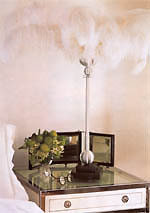 While my rooms are often anchored with a fine antique piece (I’m fond of the French 1940s designers: Arbus, Pascaud, Leleu), I’ll combine it with a more streamlined Italian 1970s cocktail table, say, in Lucite and brass. Quality will always mix with quality, provided that you are working with pieces you love. Why is what you do important to New Orleans? 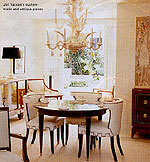 My shop offers a collection of furnishings and appointments unlike any other in the Deep South. Design enthusiasts can travel the world here! The counterpoint we provide, relative to the more “traditional” antique stores for which New Orleans is already well-known, brings a new perspective to the design community here. How does New Orleans affect your profession? What are the benefits and challenges? The variety of cultural life in New Orleans is an unending source of inspiration and benefit. Encouraging others to see old things in a new light can be quite a challenge but well-worth the effort sometimes required. What else would you be doing if you weren’t doing this? Restoring a villa in the Veneto and enjoying life there with my family. The city's always felt Old World - now it feels hip, too. Four stylish locals share their favorite places to take in the bold new flavor. In a space that was once a Chinese restaurant, JON VACCARI has opened the most elegant showroom, with extraordinary pieces - silver ibex skulls, travertine cocktail tables, and Lucite lamps. Decorator Jon Vaccari's new shop, located in a stunning 1853 Greek Revival building, has all the flair of a classic New Orleans residence. Striking table lamps by Garouste & Bonetti, black leather Marco Zanuso chairs, and a bronze vitrine created by Jacques Grange for Yves Saint Laurent's Paris boutique are juxtaposed with contemporary furnishings and lighting. Cosmopolitan glamour is what partygoers to "Sentimental Journeys" are expecting on April 20 and 21. 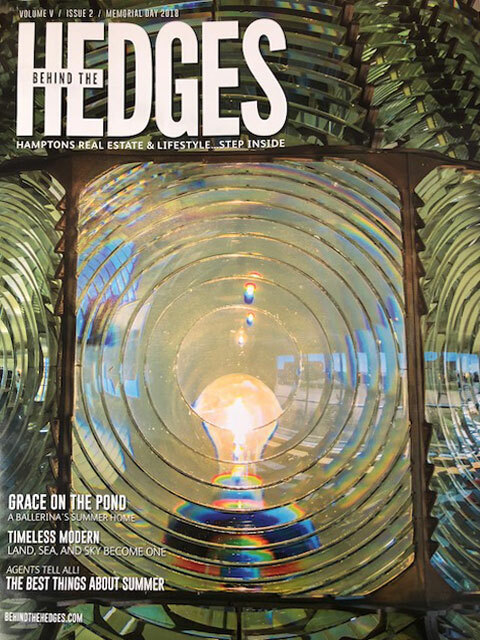 A benefit for Longue Vue House and Gardens, the event is known for its auction of exotic trips and for literally creating a whole ambiance for partygoers to celebrate in. 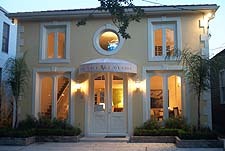 The feel in 2004 was based on the movie, "Indochine," and was dreamed up by architect Lee Ledbetter. In 2003, designer Jon Vaccari-who happens to be one of this year's co-chairs with Catherine Freeman and Sandra Pulitzer-created a 1940s Hollywood nightclub tableau. Designer John Fernandez was tapped this year, and his look promises to be exotic. Setting the scene is important, at this black-tie fund-raiser's focus is getting partygoers in the mood to bid on deluxe trips around the world. Thirty trips are part of the auction, including a Wimbledon experience with center court seats, an excursion to the Seychelles, and trek to Francis Ford Coppola's properties in Central America. The festivities kick off on April 20 with a patron party at an historic home in the Garden District. The cuisine will be handled that night by chef John Besh of Restaurant August with guest chef Michel Richard of Citronelle in Washington D.C. The gala on April 21 is when partygoers will be wined and dined -this night the food is overseen by host chef Peter Moore of the Ritz-Carleton New Orleans with guest chef Thierry Rautureau of Rover's Restaurant in Seattle. The musical entertainment back by popular demand-is Pepe and the Bottle Blondes. And of course, there will be the auction. 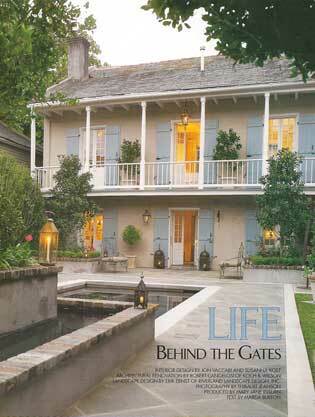 The money raised at the event is essential for Longue Vue House Gardens, a National Historic Landmark in New Orleans. 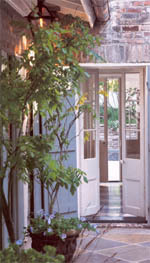 The home, and particularly its gardens, was damaged by Hurricane Katrina. For information and tickets, contact 488-5488, ext.337. From its origin as the merchant Felix Walker's elegant family residence to its recent incarnation as a Chinese restaurant, the Walker-Wynn House on St. Charles Avenue, designated a local landmark in 1986, still retains its historic beauty. The newly restored facade of the two-and-a-half-story, mid-19th century American townhouse, with its richly fluted Corinthian columns, curtained windows and painted front porch, suggests that it has reverted to its original use as simply an elegant residence. But, in a 21st-century nod to the 19th-century tradition of living above the store, 1912 St. Charles Ave. is both a business and home to the new owner. Louisiana-born Jon Vaccari bought the building in early 2005 with plans to set it up as a commercial space for tenants, but Hurricane Katrina put a dent in that. "Every deal fell through, " he said. "And I really thought I should sell it. But instead we decided to sell our home on Fourth Street, put a business on the first floor and live upstairs." 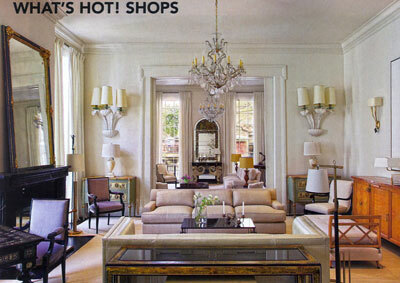 Now, the first floor is home to Vaccari's eponymous antiques store. It's accessible by a landscaped pathway between the house and the Zion Lutheran Church next door that leads to a clean-edged, contemporary glass entryway to the business. Climbing the long staircase to the living space on the second floor for Vaccari, his partner and their two young children, visitors reach a stunning living room, dining room and den area with an open kitchen, all unrestricted spaces that lead from one into the other. 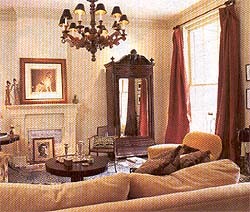 Much of the furniture came with Vaccari from the Fourth Street house, although a few pieces are on loan from the downstairs store, a wonderland of sofas and chairs, tables and lamps in a series of stylish, light-filled rooms with magnificent 14-foot ceilings. And, even though the spaces seem large because of the high ceilings and the creamy ivory color scheme, it has much less square footage than their former Garden District home. "Once we decided to move here, we did have to downsize quite considerably, " Vaccari said. But, as the renovation project took a year and a half, there was plenty of time to decide what would fit, what wouldn't and what could be added. 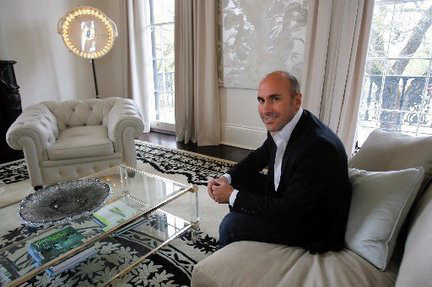 In the living room, which looks out on St. Charles Avenue, a neutral-colored sofa and two oversized leather chairs (designed by Vaccari and made in Miami) sit on a large cream-colored Portuguese rug bordered by what he calls a "shocking hint of black." The contemporary-styled coffee and side tables are by Jensen. Matching marble fireplace mantels in the living and dining rooms might look historically authentic, but are replicas of those in a European mansion and were constructed in Alabama. 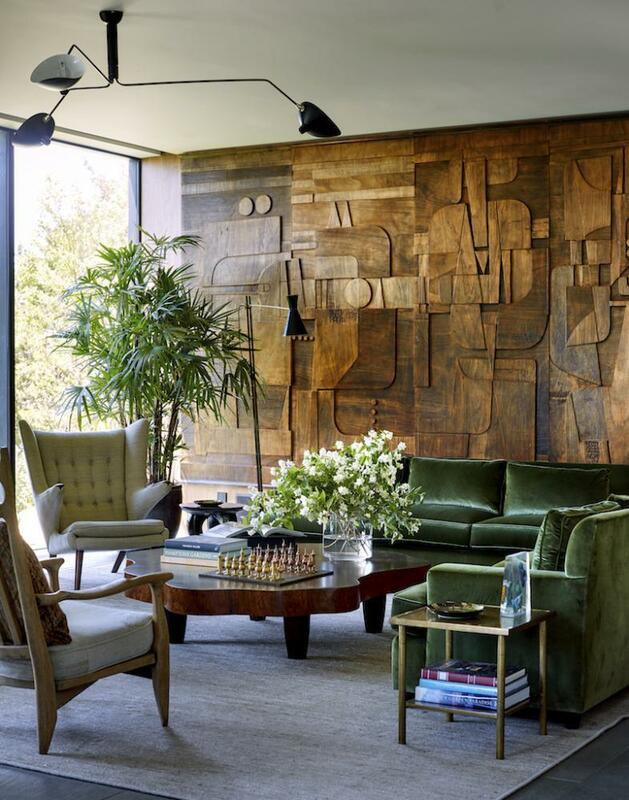 The extraordinary and enormous floor lamp, a focal point of one corner of the room, is one of a pair put up for sale at a Paris auction house. Vaccari bought one; Ellen DeGeneres the other. "This definitely is not for sale, " Vaccari said with a smile. "After all, there were only two. So, it's just Ellen and me." Thought to be a rare, mid-century example of French hospital operating room lighting equipment, the stop-you-in-your-tracks lamp has a face completely mirrored in glass that expands the amount of light put out by its single standard light bulb. 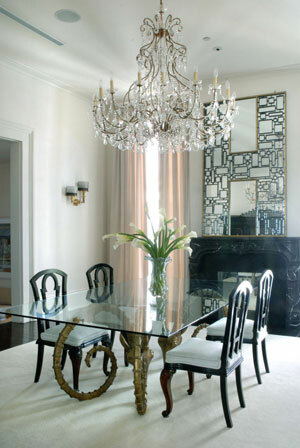 The central focus of the dining room is the glass table, with its grandiose, stylized bronze base. But it's not the only thing that commands attention in the room, for the chairs make a statement, too. Parisian in origin, they demonstrate a strange but interesting mixture of Asian influences on the backs and European influences on the cabriole legs. Paris is also the origin of the ebony-colored breakfront against the inside wall. "I bought it from a woman who owned a store I would visit each year when I went to France, " Vaccari said. "I was fascinated by the Asian influences on the piece, especially the carvings of a male on one side of the door and a female on the other." Next to the dining room and down a couple of steps is the equally elegant, yet comfortable den and kitchen. Two leather sofas created by the famed Swiss de Sede company rest comfortably among Tibetan temple architectural fragments and a lamp made from a bronze Asian deity. 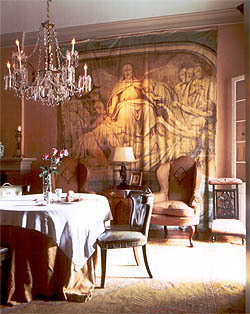 A large Polidori painting of Napoleon at Versailles hangs on one wall and, in a gesture to 21st century family comfort, a large flat-screen television is on the opposite wall. 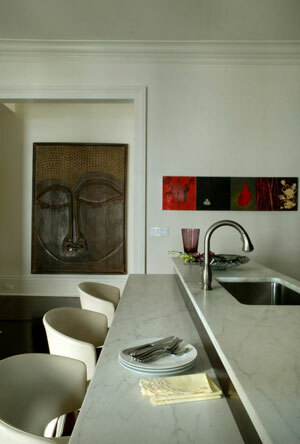 A marble-topped eating bar separates the kitchen from the den, and is the one area of the home that is completely contemporary in style, with its java-colored cabinets and stainless steel pulls and stove vent. 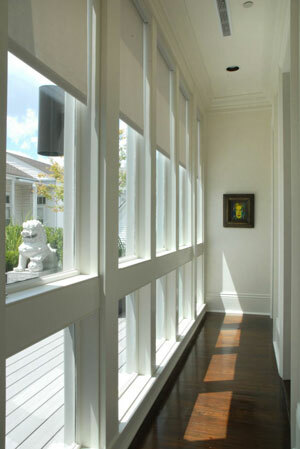 A long, light-filled and glass-encased hallway leads to the back of the house and the master bedroom and guest suites. The children's rooms are on the third floor. 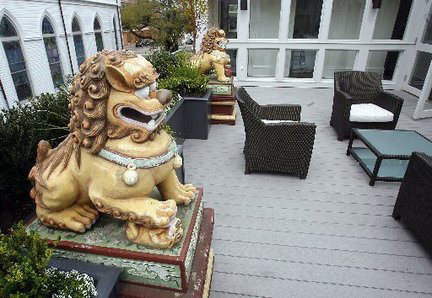 The master suite looks out onto a terrace complete with potted plants, patio furniture and a pair of ritual Chinese lions, the last remnants of the old Kung's Dynasty restaurant that once occupied the building. 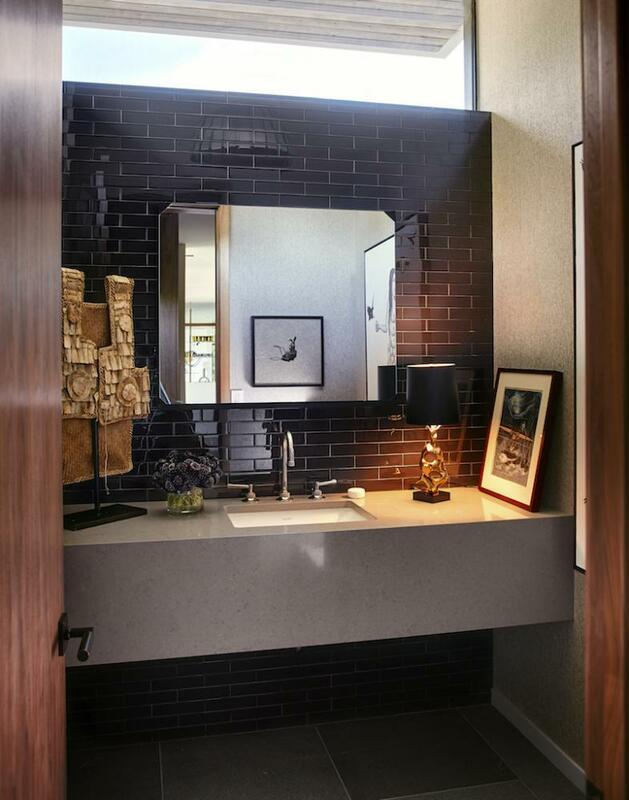 Because Vaccari's work and lifestyle shuttles the family between New Orleans and a chic condo in a soon-to-be-restored warehouse in New York City's Soho district, he loves the convenience of spending his days and nights in one location. He also loves the city sounds that seep into his building, particularly the hourly chimes from the church bells next door and the continuous rumbling of the streetcars as they pass. It's a welcome change from his former, too-quiet Garden District residence. Though the house was large, "I felt cooped up there, " he said. "I think it's because it just didn't have an urban feel. We had moved there from the French Quarter, which we loved because you could just get up and go. When we moved to the Garden District, we realized it wasn't that way. "Here, we can get up and go again, on the streetcar, or just walking out along the avenue." 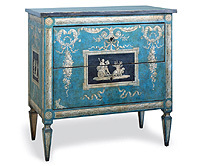 A pair of beautifully painted 1850s Italian commodes, $32,000, feature classical figures, garlands and ribbons. 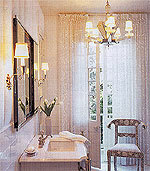 Jon Vaccari Design (504-899-7632; www.jonvaccaridesign.com) showcases an elegant mix of periods and styles. 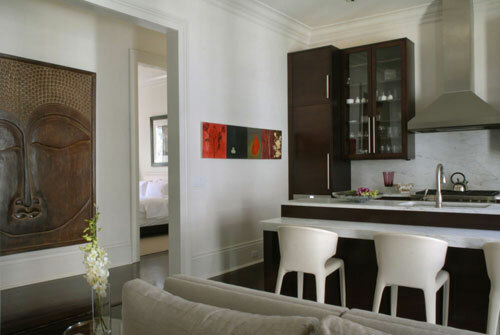 Jon Vaccari Design in New Orleans (504-899-7632; www.jonvaccaridesign.net) shows an Art Deco French mahogany and mahogany-veenered cabinet, $14,750, with nickel hardware and three adjustable shelves inside. Jon Vaccari's New Orleans shop. Do you...never know what you're wearing until the last possible minute?...buy favorites in duplicate and in different colors?...never wear the same getup twice?...make snap judgements regarding new purchases and rarely make returns?...treasure your collection of accessories and love to admire them en masse?...always know where to find it in your closet? CONGRATULATIONS! Clearly, you possess the fashion gene. And like our most fashionable New Orleanians '05, you are in an elite group of cool and top-notch collectors of clothing and accessories. What Jon Vaccari is wearing for the photograph: Generre lavender cashmere sweater, Dolce & Gabbana wool plaid pants, Prada belt, Gucci shoes and Thierry Mugler leather jacket. The glamorous inventory ranges from 19th-centurary to 1940s French. Lamps, chandeliers and furniture seem straight off a Lana Turner movie set, including Vaccari-designed ultrachic white leather chairs. The L-shaped structure clocked in at a diminutive 1,700 square feet, had low ceilings, tiny rooms and no air conditioning. And, the vinyl floor of the outdated kitchen proved that it hadn't been redecorated or renovated since the 1950s. But for local designer Jon Vaccari, the challenge of turning a circa-1829 slave quarters into a comfortable, spacious home with plenty of room for entertaining, as well as easy access to an outdoor oasis, was irresistible. "Everyone thought I was crazy when I bought it," Jon says, "even my mom." Even he wasn't really sure that this would be his future home the first time he laid eyes on it. "It had good bones," Jon says, "but no frills." The house, on a nondescript block of Ursulines Avenue, left much to he desired. But Jon and his partner, Steve Fleming, immediately dove into the project. "I wanted it all," he says, "including a pool, a patio, fountains and parking." They had eight months of renovations ahead of them. 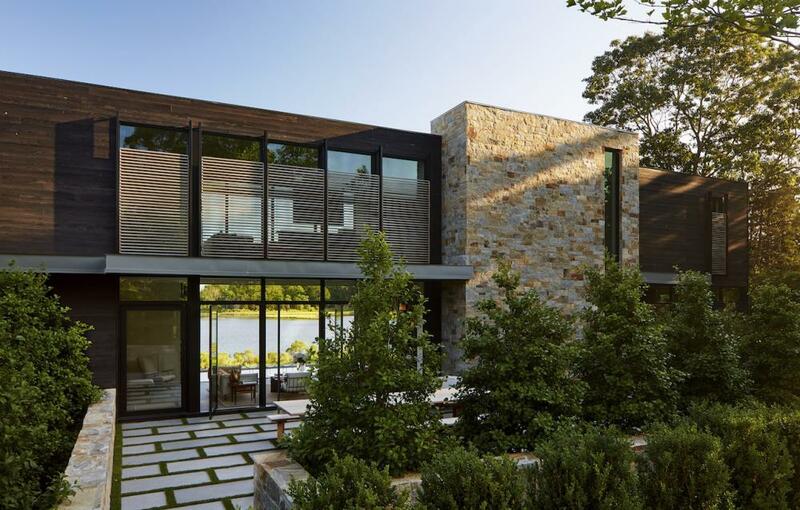 Jon, with the help of architect Robert Cangelosi, of Koch & Wilson, designed and constructed an 1,100 square-foot addition that looked much like the original structure, where a carriage house once stood. The once L-shaped residence now forms a U around a private internal courtyard, a shape reminiscent of classical Greek and Roman architecture. "When I was a child, I used to draw pictures of buildings that looked like that," Jon says. "It reminds me a little bit of Pompeii." Whatever the inspiration, the design is effective. And now the home has 2,800-square-feet of living space, and the front yard-a rare amenity in the Quarter-has the pool, patio and ample parking they desired. 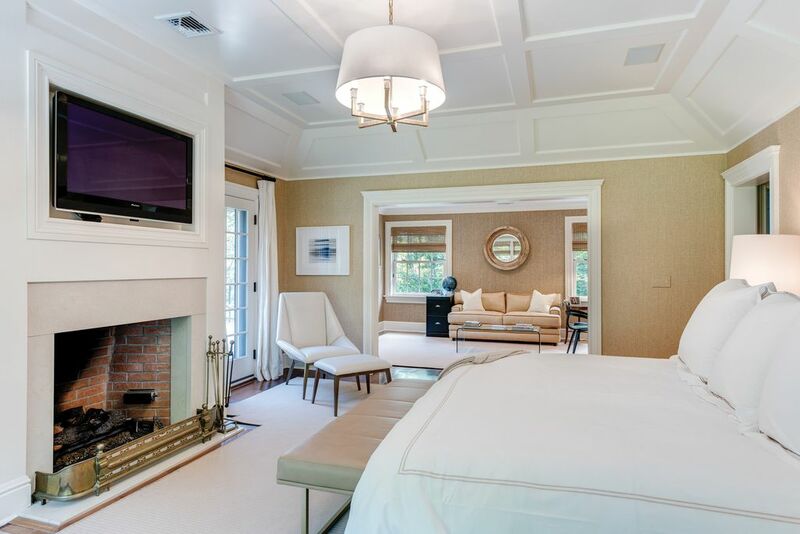 To make the inside more elegant, they raised the ceilings from eight to 10 feet, replaced 50 percent of the flooring with red pine, and added moldings and antique French doors. Jon notes that there are no windows, only French doors that open out onto lush garden patios and second-story galleries. 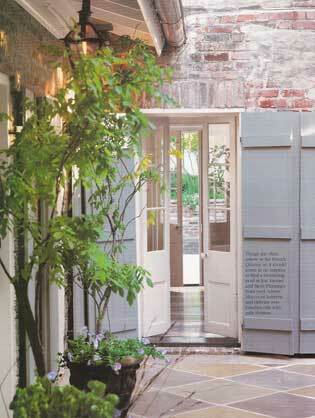 He says he likes to blur the lines between indoor and outdoor living, by bringing the charm of the exterior inside. But even with the improvements, Jon and Steve did have to make a few adjustments. "We went from a grand home with huge rooms and 14-foot ceilings to a smaller, more cottage-style home," Jon says. "Our old furniture just didn't fit. We had to get rid of it and start over." To Jon, that was an opportunity. "I wanted the interior to be charming, but a little bit funky," he says. "I wanted it to say something about who we are and to reflect our interests and our trrvels." What it says: 1940s Hollywood glamour meets the Orient. 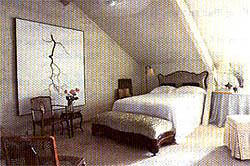 Jon graciously appointed every room with a mix of styles and items. 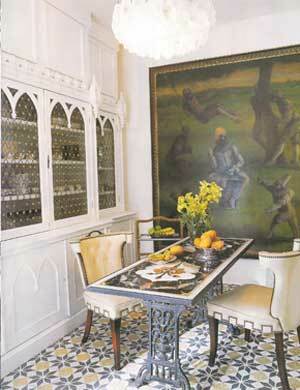 Blue and yellow Moroccan kitchen floor tiles mix with gothic-arch inspired built-ins and 1960s chandeliers. A Moroccan rug is paired with a 1940s-style blue banquette and palm-frond motif moldings that used to adorn The Sazerac Bar in the Fairmont Hotel. 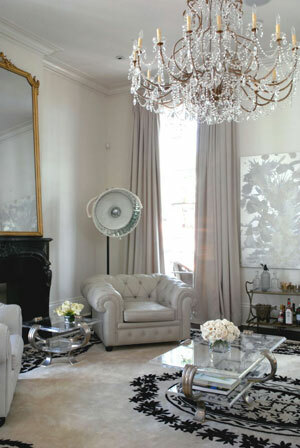 Pinning down Jon's personal style is impossible, but he admits he loves mixing chrome with Louis XVI. "I'm not scared," he adds. Every piece of Jon and Steve's home reflects a piece of their lives, from the time Jon spends in France visiting his sister, Nori, to hints of the years he spent living and working in Miami and Los Angeles. "I like the glamour from L.A., the funkiness of Miami," as well as the Moroccan touches from his travels with Steve. Although many of Louisiana's native children travel or move to those places and don't come back, for Jon, that wasn't an option. "We wanted to be really a part of something quirky and special," he says. 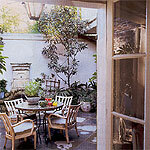 "I always dreamed of living in the French Quarter. I was fortunate: my dream came true." This lamp is pleasantly unexpected when perched on a Louis XV desk, says New Orleans designer Jon Vaccari. 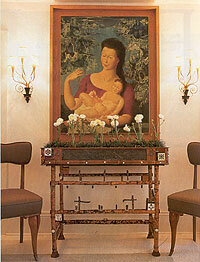 Surround it with other French furnishings from the forties and antique Angelo Mangiarotti or Venini fixtures. "The lamp has modern lines, but the pleated fabric shade gives it softness," says Vaccari. 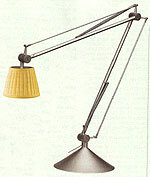 Aluminum lamp, Philippe Starck, $325; 800-939-3567. This French settee, circa 1950, certainly has "curve" appeal. The black lacquer frame in a swooping shape is highlighted by a Manuel Canovas cotton stripe. 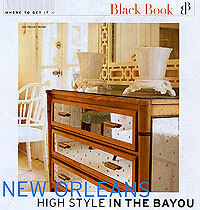 Jon Vaccari Design, 4858 Magazine St. - 899-7632 - or go to www.jonvaccaridesign.com. As a former resident of Los Angeles, Vaccari knows a thing or two about glitz and glam. Nine years ago, he left the hustle and bustle of his advertising career in California and retreated to The Big Easy. Raised in Morgan City, Louisiana, he is no stranger to the South and is keen to the New Orleans vibe. "People think that New Orleans runs at a slower pace, but that's because it's a personable city - more social and always involved. It's easy to enjoy life here," says Vaccari. His design studio helps make that good life possible. The space is organized into what he calls a "home flow," with a pair of '30s Deco club chairs in the living area, an Italian dining suite in the dining room, and two '40s glass lamps that tower over a study desk.As a result, the store looks lived-in. Ironically, at one time it was. Previously a '60s fourplex, the building was gutted and remodeled by Vaccari. The result is a spunky South Beach-inspired facade that hints at his design motto showcased within: "elegantly conceived, with a slight edge." 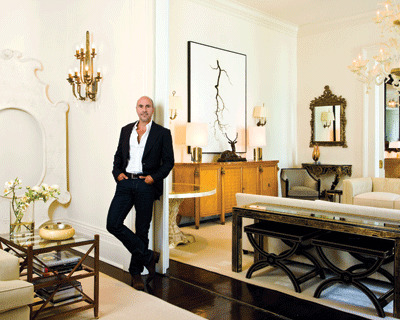 Vaccari's unique way of combining 19th-century antiques from Italy and France with vintage '40s, '50s, and '70s pieces is what distinguishes his look. He shops in Europe and Stateside, as well as exotic locales, such as Morocco. "When antiques hunting, the most important thing to know is the country's culture," says Vaccari. His well-trained eye sees items that others pass up. During one of his trips to Paris, he discovered a pair of sconces that stood 4 feet high, and although they were broken, the designer recognized their presence. Today, the restored lamps highlight the showroom's entrance. As for Vaccari's own evolution, he is considering an expansion from New Orleans to New York. 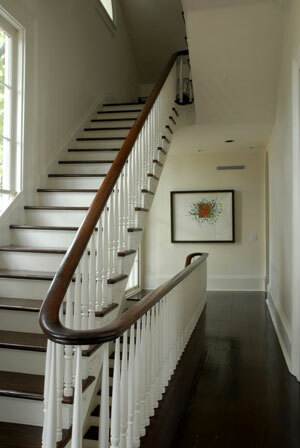 In the meantime, his designs will continue to dazzle his Southern home. Jon Vaccari is a typical New Orleans native in that he's always looking for a good excuse to throw a party. And like so many of the denizens of the lush, tropical city, his heart belongs to the mistier precincts of the past. For a time, French rule prevailed, forever lacing this corner of the United States with Gallic language, law, food, architecture, manners, and other fine points of an old and glamorous civilization. 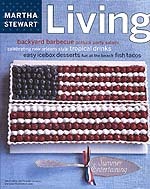 Last year, instead of marking the Fourth of July in the usual American fashion, he chose to pay tribute to the unique culture of his hometown and to host a casual gathering on July 14th, Bastille Day. While there may be few treasures left to buy in New Orleans' French Quarter, there's little in that hard-partying tourist district that remains undiscovered. But just a beignet's throw away is calmer, more sophisticated Magazine Street, a six-mile stretch of shops selling excellent art and antiques, as well as chic jewelry and clothing. The street seems to be in a state of perpetual improvement, in fact, with good stores and restaurants opening regularly. What lies hidden behind old walls of the French Quarter is always intriguing. Visitors walk the narrow streets peeking into gates and porte cocheres for glimpses of how people choose to live with the past. Although aged is a given in the district, Jon Vaccari and Steve Fleming's circa 1830s house has a fresh, new spirit. "I want everything life has to offer in the French Quarter," says Vaccari, "and also privacy, parking, courtyards and a swimming pool." He and architect Robbie Cangelosi took an L-shaped former slave quarter and turned it into everything the owners want for their style of living. "I love entertaining," says Vaccari. "I love bringing people together. I love living outdoors. Living life is everything." The Victorian house in front of their property burned in the 1870s, leaving a rarity - a French Quarter front yard with enough space for parking, courtyard and pool. Privacy came with the design of a brick fountain thickly planted with azaleas and a large ligustrum tree. Across the back of the property a new two-story wing was built in the same style as the main house. Now the house is U-shaped surrounding a rear courtyard accessible on three sides from living quarters. "It's perfect for us," says Vaccari, "since everything flows from indoors to outdoors." Vaccari's design career began in Los Angeles. "I love the old Hollywood look of the 30s and 40s," he says, "and I love the antiques and decadent flair of New Orleans that you can't find anywhere else. I also like a touch of ethnic to give it an edge. I'm attracted to Moroccan design. In my new house I combine it all. Vaccari opened up the house by tearing out old partitions that boxed in tiny rooms. "Now rooms are large and open." Furnishings are flexible. 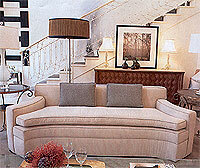 For example, the dining room is usually set up with coffee tables in front of corner banquettes. By substituting larger tables, the room is ready for dining. 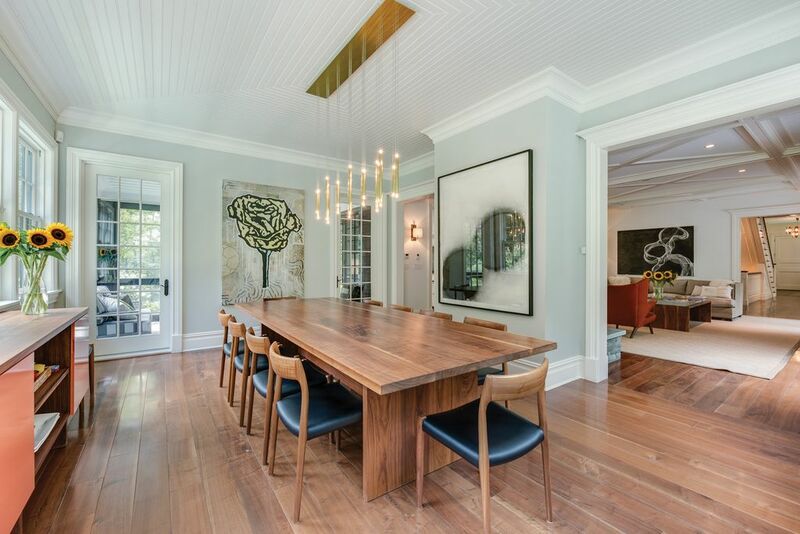 "Traditional dining rooms seem like a waste of space," Vaccari says. "My guests can relax and lounge, or I can throw an elegant dinner party." Last renovated in the 1950s, the house now has been thoroughly updated. A multiple-use den instantly converts to a theatre with a state-of-the-art sound system and a screen sliding down from the ceiling. A staircase to the attic created a third-floor hideaway. 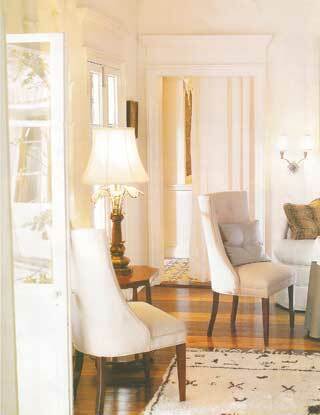 For more elegance, moldings were added and doors heightened and redesigned to correspond with exterior French doors. When Vaccari sold his former domicile, "Steve and I moved from grand to intimate. Because of the difference in scale and ceiling height, we had to get rid of ninety percent of our furnishings. It gave me a chance to create something entirely different." That chance to create is crucial. "I'm always in search of a creative outlet," adds Vaccari, who already has another project: a new studio showroom on Magazine Street to present his furniture designs. One of the few furniture stores in the area not dedicated to classical French antiques, Jon Vaccari's perfectly appointed white showroom and adjacent bungalow are stocked with 19th- and 20th-century furnishings with a modern edge. We loved the 1925 gondola chair freshened up in black-and-white calfskin ($2,500) as well as the 1890s Scandinavian settee recovered in celadon velvet ($2,000). In addition to carrying a few reproductions, Vaccari also makes pieces, such as the white-leather library chairs ($1,300 each) that are displayed with a 1940s mahogany table ($3,500). Rounding out the selection are paintings, photographs, and ceramics from the 1960s. When photographers want to make a building glow from within, they often take painstaking measures involving special equipment and techniques. 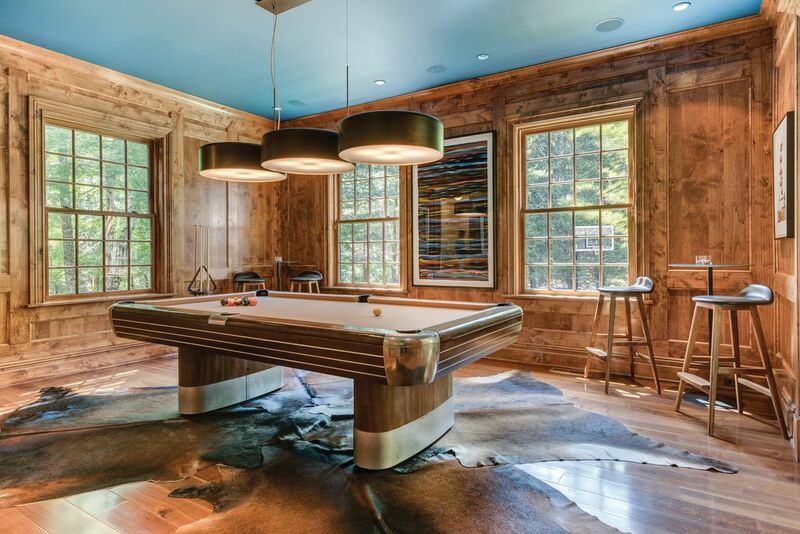 But strobe lights and long exposures aside, the new Magazine Street interior design studio of Jon Vaccari (4858 Magazine St., 899-7632) has a luminous quality even to the naked eye. At night, the windows across from its facade reveal an airy interior and a mix of furnishings and accessories that is part Hollywood glamour, part refined elegance and part mid-century modern. 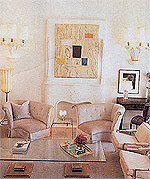 A Louisiana native, Vaccari became interested in design while working for a Los Angeles advertising firm in the 1980s. After outgrowing a smaller Magazine Street space, he decided to open a new studio that would serve as an office and showcase his own furniture designs as well as the pieces that he buys abroad  all in a home-like setting. When his real estate agent contacted him about a four-plex on Magazine Street, friends warned that the nondescript brick building was beyond help. But Vaccari wasnt so easily deterred. Smitten with its pluses  its size, off-street parking in front and a large backyard for expansion and landscaping  he gutted the building and redesigned the interior which now has an upstairs office overlooking the ground level. He also gave its exterior a classically contemporary update, using salvaged architectural elements to accomplish the effect. The windows and front door came from demolition yards; the wrought-iron deco staircase banister and railing are from France. Vaccari even had an unusual cobalt blue chandelier constructed from 200 Murano glass tubes that were sold individually. When it comes to finding a good chair, Jon Vaccari has strict criteria. Its hard to find a chair that sits properly and is comfortable and has the right scale, says the New Orleans-based designer whos particularly fond of mixing 20th century modern with French antiques. So five years ago, when Vaccari found a chair that satisfied his requirements, he scooped it up immediately, upholstering it in a cream-colored leather with nail-head trim, for use as a breakfast chair in his own home. The chair was so often admired and so versatile that he also began producing a slightly modified version for his customers. I love the shape of the chair, and its comfortable, he says. Because of the scrolled arm, youre able to sit at an angle; the curve offers you back support. Jon Vacarri has turned a quirky three-cottage compound on the Mississipi coast into the perfect weekend retreat for entertaining house guests. 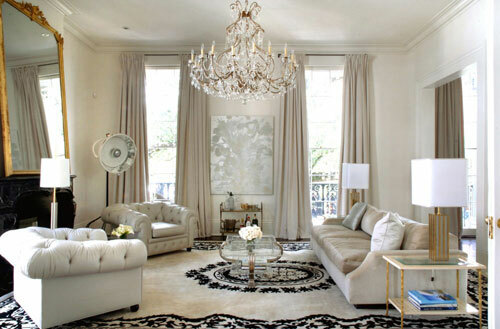 Seven years ago when a young decorator named Jon Vaccari left Los Angeles and moved to New Orleans, he found a great apatment in the French Quarter and considered himself settled - but only for a moment. It wasn't long before Vaccari began hankering for a weekend house where he could escape the city's heat and entertain his friends. "One day I just drove to the Mississippi Gulf Coast," says Vaccari. "I crossed over Bay St. Louis into the town of Pass Christian and was shocked at how beautiful it was - all these large white Southern houses with huge lawns and oak trees." Louisianians have been repairing to Pass Christian for over 100 years, treasuring the tiny waterfront town for the delicious breezes that tumble off the Gulf of Mexico - more valuable than diamonds in these parts - and for its frolicsome ambience. The beachfront houses that Vaccari happened upon - a three-mile cavalcade of picturesque residences from the 1850s through the 1920s - were built primarily as summer places by wealthy Louisianans. On the fringe of this captivating old drive, Vaccari noticed a three-acre lot with three houses on it: a typical 1950s ranch and, behind it, two marvelous octagonal cottages. Known as garconnieres and built in 1845 as priest's cottages for a grand estate down the road, the fanciful pair of structures had been moved onto the property in the 1950s when the estate was subdivided. The garconnieres had faltering foundations, rotting porches, and tired kitchens and bathrooms, while the ranch house had cosmetic problems, such as crank windows on a plain facade. But none of this stopped Vaccari from buying the compound. He was envisioning house parties. "Guests love staying in their own cottages," he says. 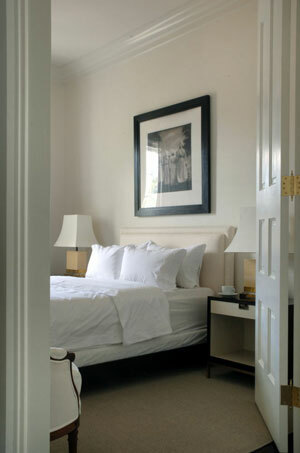 "It's wonderful waking up and having complete privacy. Vaccari restored the garconnieres to their inimitable charm, painted them white and gave them dove gray awnings.Then he turned the ranch house into something glamorous and sensual. He popped out the jalousies, replacing them with French doors and windows that open onto a glassed-in porch fronting a brick patio. 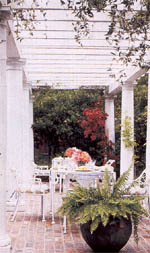 To shelter the patio, Vaccari added a white pergola that runs the length of the property and is cloaked in fragrant tendrils of wisteria and Carolina jasmine. "The pergola was built to add character to the front of the house," Vaccari says, "and it's also a structure for entertaining, where we have dinner parties or dancing." In front of the ranch house, he added a swimming pool, designing it in a classic Roman shape and painting the plaster a cool grayish-green. And on the back of the house, Vaccari built a second glassed-in porch, which opens onto another spacious brick patio - this one with a fountain made from an old iron sugar kettle. Vaccari decorated the three little houses with one-of-a-kind pieces, primarily from antiques stores and junk shops. The look is Miami Beach meets Old Hollywood, a hybrid of piquant humor and languorous glamour. The bedroom of the rear cottage, for instance, has a simple iron-frame bed with curtains of white cotton eyelet backed in pink chiffon. "Elegant, with a little funk," says Vaccari succinctly. 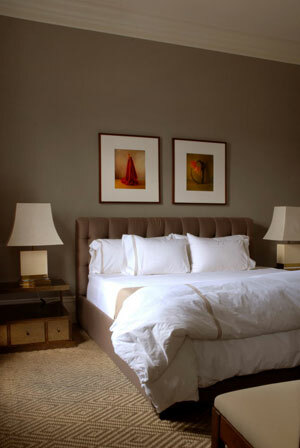 He further softened the bed with a padded headboard upholstered in a pink-bordered vintage tablecloth. Poised in front of the bed are what Vaccari calls his "I Dream of Jeannie" chairs: a pair of fabulous, droll 1950s pseudo-slipper chairs covered in a lime green, cream, and gold silk sateen stripe. He found them in an antiques store and will reproduce them for his soon-to-debut furniture line. The houses sleep 12 people-the perfect number for intimate parties with elaborate food, chic table settings, cocktails on the lawn, games of croquet, and, sometimes, costumed charades. "I bring chandeliers outside for that decadent touch," Vaccari says. On weekends, Vaccari's friends and family fill the place. Occasionally, his sister, Nori, shows up, along with her new husband, international design star Philippe Starck. And everyone rides in dashing style: Vaccari keeps two restored mail trucks with open sides - one sky blue, the other sunset pink - for his guests to take into town or to the beach. When photographer Kerri McCafferty sought out locations to include in her new book, The Majesty of the French Quarter, she discovered Jon Vaccari's magnificent 1832, three-story mansion on Royal Street. "The house became a centerpiece of my book." She says. The book features a parade of pictures of residences, hotels, churches, restaurants, antiques shops and art galleries of the historic district. Noted 19th century architect Jules Mossey designed and built three houses on Royal Street, which became known as "Architects' Row." Vaccari's mansion is one of Mossey's trio, which joins it's sister houses, preening like magnificent ladies all in a row, with broad cast-iron balconies. The houses remain some of the finest examples of 19th century architecture with 18-foot ceilings, fine moldings, winding stairways and third-floor views of the French Quarter rooftops. "It was love at first sight when I first entered the building," recalls Vaccari, a native of Morgan City. 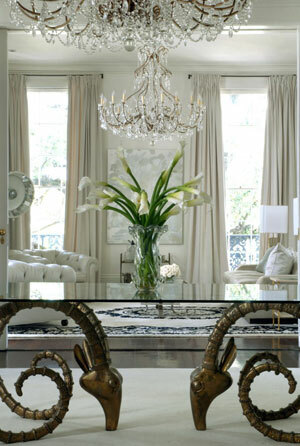 He had lived and operated a design business in Los Angeles before returning to Louisiana a few years ago. "I always wanted to live in New Orleans." he says. Once the house was his, Vaccari explains, he began work to redesign the interiors to feature the best of the old with the new. Vaccari's collection of fine antiques and chandeliers in each room is wonderfully juxtaposed with contemporary artwork by Hunt Slonem, Gregory Saunders, and Juan Lerado. When selecting furnishings, Vaccari didn't limit himself to 19th century pieces. 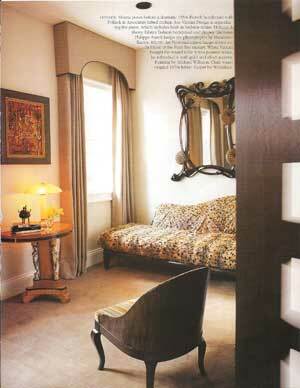 He added fine examples from later periods, including an art deco bar from the 1930s in his living room. Vintage drapes and fine contemporary fabrics are showcased on the huge windows, while Oushak rugs cover most of the hardwood floors. 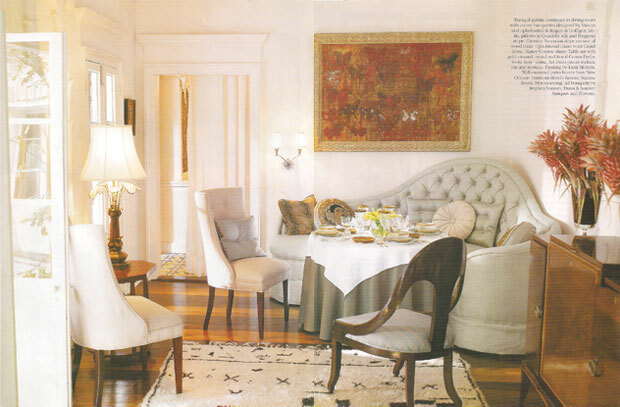 "I love the muted tones of the Oushak rugs," Vaccari says. "And when I found the antique cornices that I used in the dining room, I created a wall with two doors leading into the kitchen just so I could use all of them." 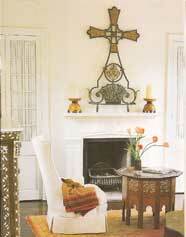 Antique religious objects lend a theatrical effect to many of the spaces. There is a definite playfulness about Vaccari's house. 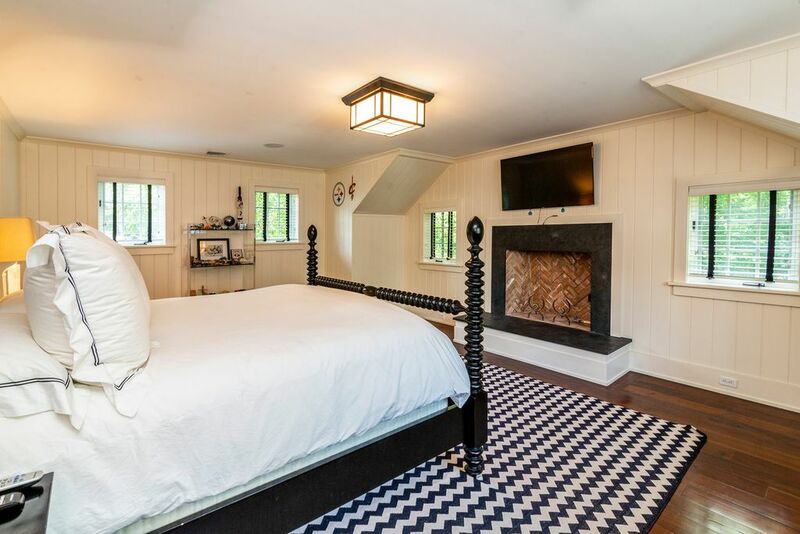 For example, the headboard of his bed in the master bedroom is actually the back of a sofa that he disassembled. He fashioned the rest of the sofa into a bench, which he uses at the foot of his bed. While the interior of the house has all the wonderful elements of a 19th century mansion, the house's outdoor spaces make it extra special. 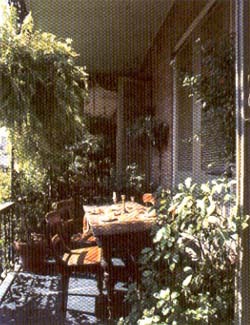 "The balcony becomes a second living or dining room for entertaining," Vaccari says. "I had a dinner party for 14 on New Year's Eve. It was exciting to enjoy the streetscape below, and the courtyard is a marvelous private retreat where you can get away from the noise of the street." It is a house worthy of the book.